Fiorello La Guardia and Franklin Roosevelt break ground on the “tube” connecting Manhattan and Queens one month prior to the 1936 national election. Members of Local 184 made Roosevelt an honorary member during the ceremony. After this long day, Roosevelt traveled north of the city to his home in Hyde Park. New Deal funds totaling $58,000,000 in 1930s dollars went into building the tunnel, which opened one month ahead of schedule in October 1940. Roosevelt was the first to drive across. I wish the image quality were higher but there is surprisingly little documentation of this historical moment. Here we see Mayor Fiorello La Guardia and President Roosevelt at the groundbreaking for what we now call the Queens–Midtown Tunnel. The photograph is from the 3 October 1936 Brooklyn Daily Eagle, the day after the groundbreaking. I was not aware until I began co-teaching this course in January of the size and scope of the infrastructure projects built in New York City under the New Deal. Of course I was aware of such efforts as refurbishing Civil War battlefields, tidying parks, planting trees, building small-scale restrooms and picnic areas along byways. But large scale infrastructure is something on a whole other magnitude. Municipal leaders outside Gotham believed the fix was in between Roosevelt and La Guardia. That is understandable given that Roosevelt had previously been the governor of New York and that he and Eleanor still owned a house on East 65th Street. The reality though was that New York City and State entered the New Deal process earlier than most locales because men like Herbert Lehman, Robert Moses, and Fiorello La Guardia were ready from the outset with plans. As the 1930s went on other municipalities caught up in real dollars. This image we see here, grainy as it is, was taken about one month prior to the 1936 national campaign in which Roosevelt ran for re-election against Al Landon. La Guardia was a Progressive Republican supporting Roosevelt. Both men understood the power of publicity and the photo op. Roosevelt’s radio address was broadcast nationally. More than 100,000 people, many of them schoolchildren, turned out on 2 October 1936 to see Roosevelt speak, Mayor La Guardia, Interior Secretary Harold Ickes, and Senator Robert F. Wagner also sharing the stage. (Earlier the same day this photo was taken La Guardia and Roosevelt together attended Game 2 of the Yankees-Giants World Series at the Polo Grounds in Upper Manhattan, a game the Yankees won 18-4.) 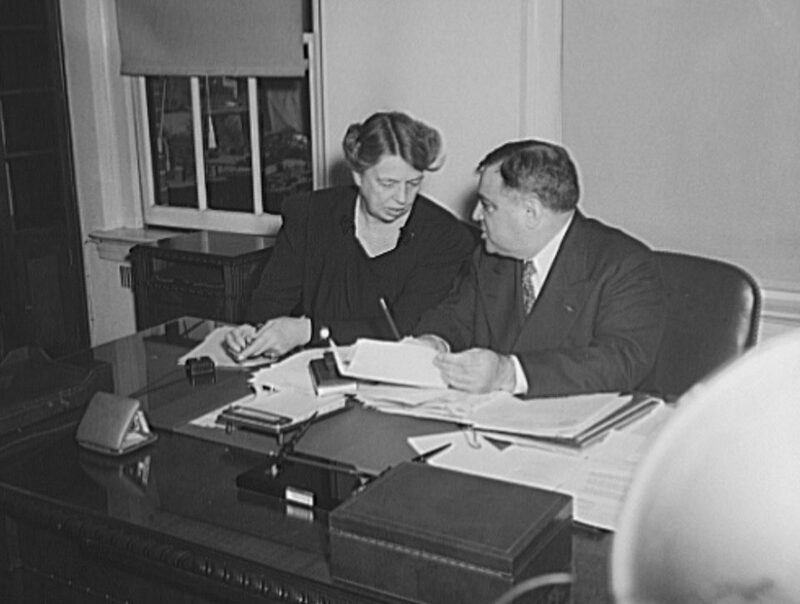 While many did not realize it at the time–though given his political instincts Roosevelt almost certainly did–the 1936 presidential election sealed the coalition of conservative white Southern Democrats, blue collar trade unionists, rural populists, African-Americans, and ethnic voters that largely held together until the tumult of the 1960s.